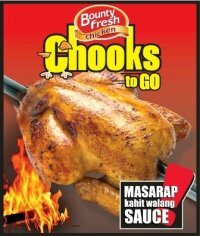 Shopping Galore: Chooks-To-Go Promo with Ensogo: 2 for P210!!! Chooks-To-Go Promo with Ensogo: 2 for P210!!! Give Chooks-To-Go as gifts! Avail of TWO (2) Oversized Chooks-to-Go for only P210 through Ensogo deals! That's 50% off! Great deal! And what's more? This promo includes free delivery within Metro Manila! Not an Ensogo member yet? To register, click here. • Promo is valid at Chooks-to-Go Chicken Metro Manila branches only. • Promo is inclusive of delivery charge. • Purchase is limited to 5 vouchers per person/household. • One household/address can only use up to 5 vouchers for the entire promo. • If one household/address exceeds the 5 voucher limit, additional vouchers will not be honored nor refunded. • Voucher is transferable and may be given as gift. • Price is inclusive of all service charge and VAT. • No cash back or credit (non-refundable) for any unused amount. • Voucher cannot be used in conjunction with any discount card or promotion. • In the case of an unavailable flavor variant, customer has the option to convert both chickens to the available flavor, or to wait for the availability of both flavors, provided redemption still falls within the validity period. What are you waiting for? Buy now! Click this link to learn how! Will my Discount cards be accepted for payment of my dinner party?